Coming from North America, bread bowl dips were very common at parties. You can prepare it in advance and take it along a picnic or even to the beach. My favorite dip is an easy Spinach Dip which is made with a package of Knorr Vegetable Soup Mix and frozen spinach, which sound strange but is delicious! This dip is served inside a hollowed out cobb loaf or sourdough bread, creating a bread bowl full of dip. It’s so good, people will even eat the bowl, trust me! If you love dips, check out my hot Cheesy Crab & Artichoke Dip. The original recipe has one small can of water chestnuts added for crunch, but I usually don’t have this readily available in my cupboard and sometimes skip it. Usually I use whatever block of cheese I have in the fridge, mozzarella or cheddar (because this recipe doesn’t have enough fat content in it!) Make sure you squeeze the spinach as dry as you can, using your hands. After its cooked, spinach releases lots of water, which will ruin your dip. Knorr doesn’t make dried vegetable soup packages here in Australia. For my Aussie readers, the closest thing I can find is Continental Spring Vegetable Soup Mix 30 grams, which works great. You could use Light Sour Cream and Fat Free Mayo, but it really doesn’t taste the same as the full fat products. Instead of Sour Cream, you could use plain Greek Yogurt, which would be healthier. I love hollowing out a Cobb Loaf to create a bowl, such a great way to serve an appetizer! 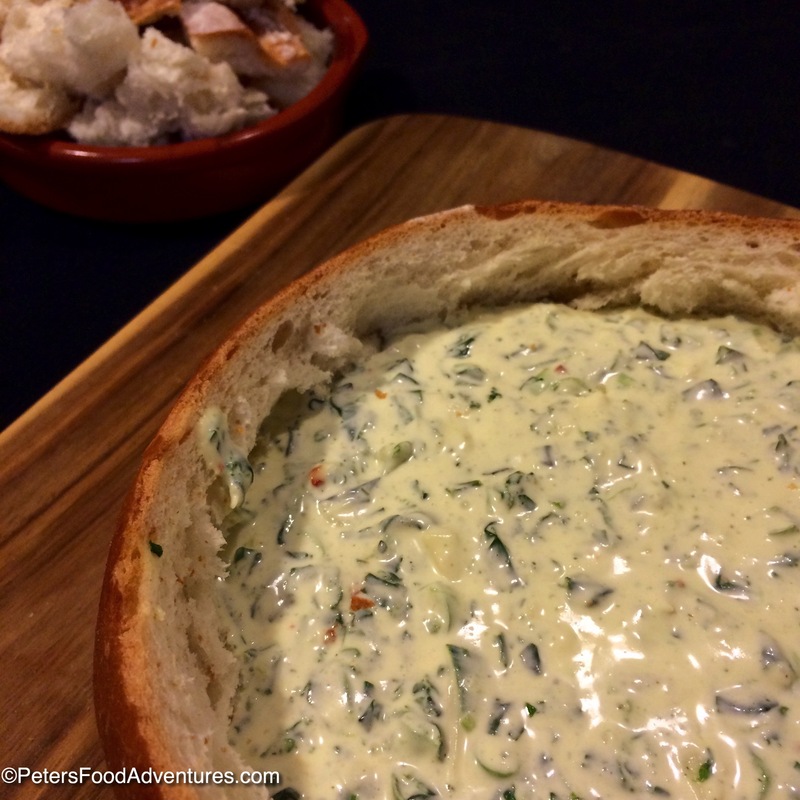 This easy Spinach Dip recipe is really quick to make, and is a proven crowd pleaser! Just don’t tell them how easy it was to make. Bon Appetit! Приятного аппетита! In a bowl, mix all the ingredients together except the loaf of bread. Chill for about 2 hours to allow the flavours to meld together. To make a bread bowl from your loaf of bread, using a knife, hollow out the insides creating a bowl. With the bread you removed, cut them into cubes and set aside to go with your dip. When you are ready to serve, put the dip inside your bread bowl and serve with bread cubes, cut vegetables, crackers or potato chips. If you love spinach, you can double the spinach in this recipe. The water chestnuts are optional, but add extra texture and crunch. A party staple indeed. I don’t see it nearly as much now though as I did growing up. Maybe the whole low carb thing. It is also great with raw veggies, though in the loaf of bread is just the best! Every time my family gets together they all (heaps of them) request me to make this, as they love it so much, it has become my signature dish, and I get raves from everyone about how good it tastes. I also use the exact same recipe, and I prefer it without the chestnuts. I use praise Mayo & home brand Coles sour cream/soup, tastes better to me than all the others I’ve tried, and it does make a big difference in flavour I can tell. Yummm, the taco seasoning sounds great! My kids are going to love that! Well this is the day for delicious Peters Food Adventures in my kitchen. Just made the spinach dip and added marble cheese as it was all I had. YUMMMMY RESULT! For all you Canadians I did use Helmann’s and Knorr Veg Soup Pkg. Another first for me… Easy, very tasty … Can’t guarantee it will actually make it to the party tonight!! The most popular sandwich at any of our church events is a sandwich I make with a similar spinach dip. My recipe uses one cup each of sour cream and Hellman’s mayonnaise…. no water chestnuts and no grated cheese. I originally used this as a dip in a hollowed out pumpernickel bread loaf. It, too, disappeared quickly at any party. So much so that I had to make sure I had a knife handy to help cut up the bread bowl (makes more even chunks rather than tearing). The main thing with this recipe is to make sure you squeeze as much water out of the thawed spinach as you possibly can. Sounds yummy! Definitely right about squeezing the spinach! No one likes a watery spinach dip! ???? DO you cook the frozen spinach?? Peter is correct. No need to cook, because frozen spinach is already cooked. Just thaw and squeeze out the water.